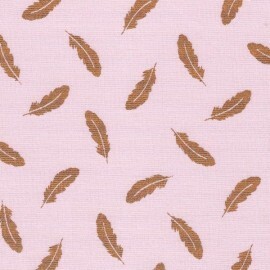 Be light as a feather with this pretty Oeko-tex certified patterned Plumette cotton poplin fabric. 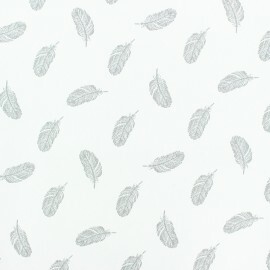 With this soft 100% cotton fabric and pretty grey feather patterns on a white background, create trendy and timeless clothes and accessories. 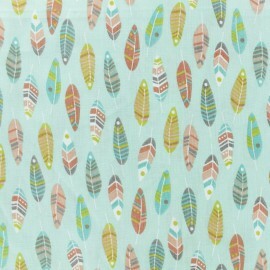 Be light as a feather with this pretty Oeko-tex certified patterned Plumette cotton poplin fabric. 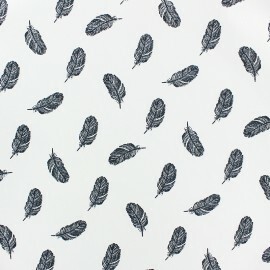 With this soft 100% cotton fabric and pretty black feather patterns on a white background, create trendy and timeless clothes and accessories. Discover this colorful and trendy 100% cretonne cotton fabric. 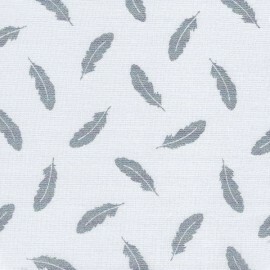 Fall for this amazing Miwok cretonne cotton fabric with pretty vintage feather patterns on an ice blue background! Flexible and easy to sew, this Oeko-Tex certified cotton fabric will suit to all your desires for clothing or decoration creations. 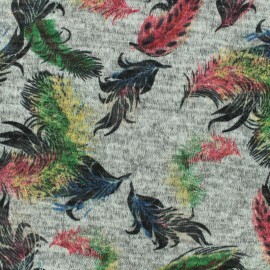 Fall for this very pretty Plume de Paon polycotton fabric with very large pink, purple and gold peacock feather patterns on a linen aspect background. 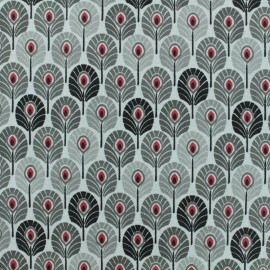 We adopt this colorful and chic fabric for cushions, curtains and accessories inspired by the Art Deco style. 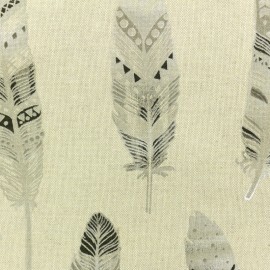 Fall for this very pretty Ethnic Feather polycotton fabric with very large silver feather patterns on a linen aspect background. 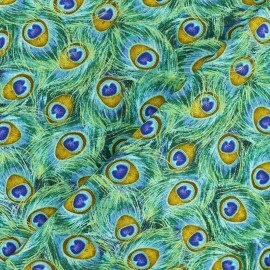 We adopt this colorful and chic fabric for cushions, curtains and accessories. 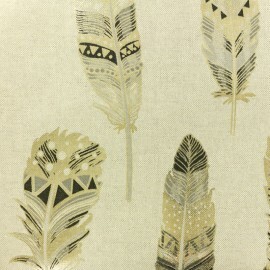 Fall for this very pretty Ethnic Feather polycotton fabric with very large gold feather patterns on a linen aspect background. 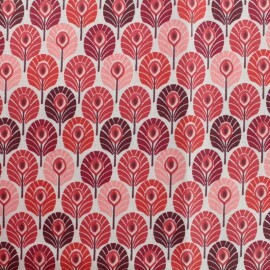 We adopt this colorful and chic fabric for cushions, curtains and accessories. 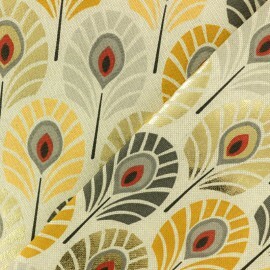 Fall for this very pretty Plume de Paon polycotton fabric with very large yellow and gold peacock feather patterns on a linen aspect background. 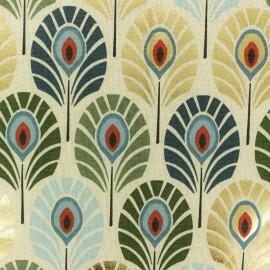 We adopt this colorful and chic fabric for cushions, curtains and accessories inspired by the Art Deco style. 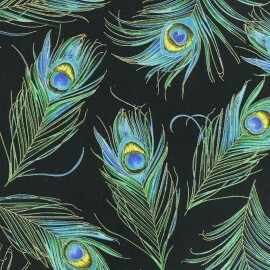 Fall for this very pretty Plume de Paon polycotton fabric with very large blue and gold peacock feather patterns on a linen aspect background. 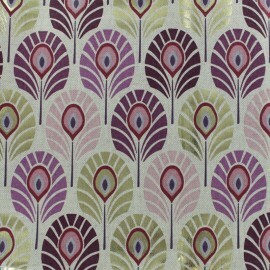 We adopt this colorful and chic fabric for cushions, curtains and accessories inspired by the Art Deco style. 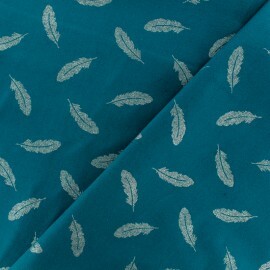 Beautiful cotton fabric from the "Tout ce qui brille" collection designed by Froufrou, with a Turquoise blue background and delicate silver feathers. 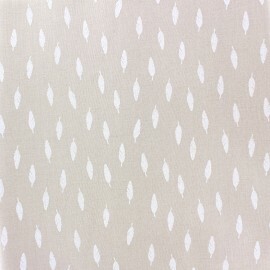 This very light cotton is ideal for making clothes and accessories. 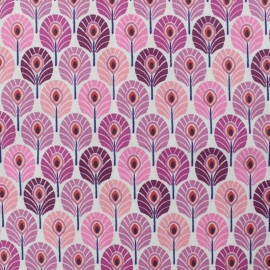 Beautiful cotton fabric from the "Tout ce qui brille" collection designed by Froufrou, with a pink background and delicate silver feathers. This very light cotton is ideal for making clothes and accessories. 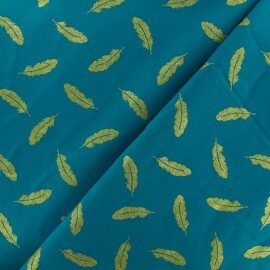 Beautiful cotton fabric from the "Tout ce qui brille" collection designed by Froufrou, with a Turquoise blue background and delicate golden feathers. This very light cotton is ideal for making clothes and accessories. 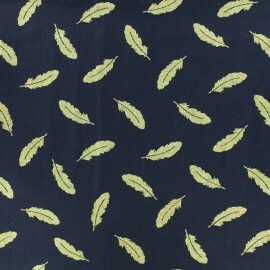 Beautiful cotton fabric from the "Tout ce qui brille" collection designed by Froufrou, with a navy blue background and delicate golden feathers. This very light cotton is ideal for making clothes and accessories. 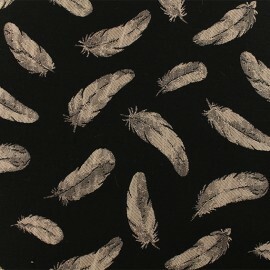 Fall for this black Ballet Aérien jacquard fabric with light pink feather patterns . This Oeko-Tex certified jacquard fabric is ideal for making skirts or jackets, use its pink reverse for contrasted lapels. You can also use it for your home furnishing and decoration projects. 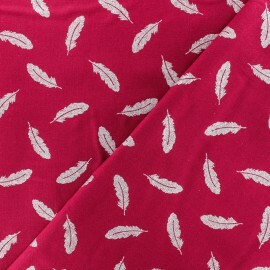 Pretty coated cretonne cotton fabric with plum peacock feather pattern. In China, the peacock is a sign of peace, prosperity and beauty, as expressed by its plumage adorned with so many colors. We adopt this Oeko-Tex colorful fabric, ideal to make cushions, curtains, accessories, clothes, etc. 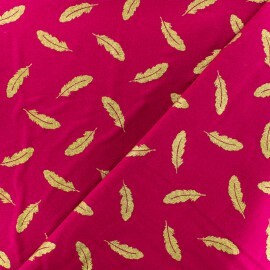 Pretty coated cretonne cotton fabric with red peacock feather pattern. In China, the peacock is a sign of peace, prosperity and beauty, as expressed by its plumage adorned with so many colors. 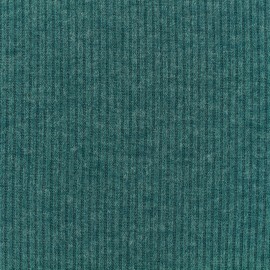 We adopt this Oeko-Tex colorful fabric, ideal to make cushions, curtains, accessories, clothes, etc. 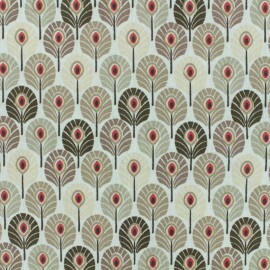 Pretty coated cretonne cotton fabric with orange peacock feather pattern. In China, the peacock is a sign of peace, prosperity and beauty, as expressed by its plumage adorned with so many colors. We adopt this Oeko-Tex colorful fabric, ideal to make cushions, curtains, accessories, clothes, etc. 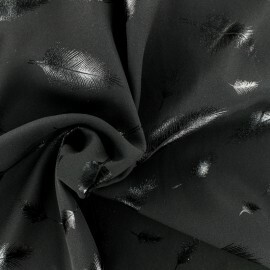 Pretty coated cretonne cotton fabric with black peacock feather pattern. In China, the peacock is a sign of peace, prosperity and beauty, as expressed by its plumage adorned with so many colors. We adopt this Oeko-Tex colorful fabric, ideal to make cushions, curtains, accessories, clothes, etc. 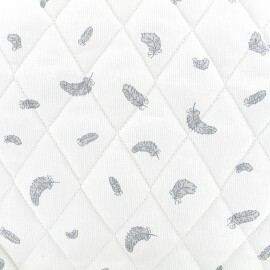 Pretty coated cretonne cotton fabric with beige peacock feather pattern. In China, the peacock is a sign of peace, prosperity and beauty, as expressed by its plumage adorned with so many colors. We adopt this Oeko-Tex colorful fabric, ideal to make cushions, curtains, accessories, clothes, etc. 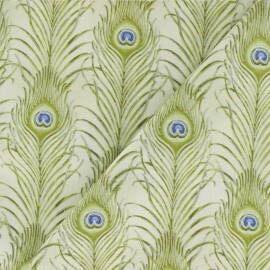 Pretty coated cretonne cotton fabric with absinthe green peacock feather pattern. In China, the peacock is a sign of peace, prosperity and beauty, as expressed by its plumage adorned with so many colors. We adopt this Oeko-Tex colorful fabric, ideal to make cushions, curtains, accessories, clothes, etc. 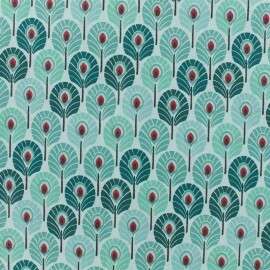 Pretty coated cretonne cotton fabric with mint green peacock feather pattern. In China, the peacock is a sign of peace, prosperity and beauty, as expressed by its plumage adorned with so many colors. We adopt this Oeko-Tex colorful fabric, ideal to make cushions, curtains, accessories, clothes, etc. 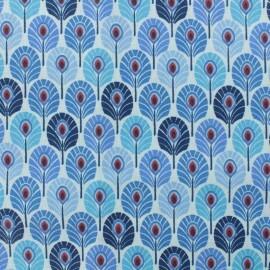 Pretty coated cretonne cotton fabric with blue peacock feather pattern. In China, the peacock is a sign of peace, prosperity and beauty, as expressed by its plumage adorned with so many colors. We adopt this Oeko-Tex colorful fabric, ideal to make cushions, curtains, accessories, clothes, etc. 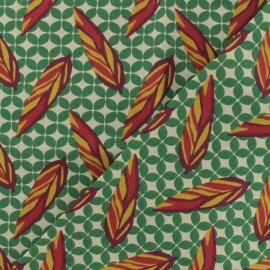 Oeko-Tex cretonne cotton fabric with red feather on green background. 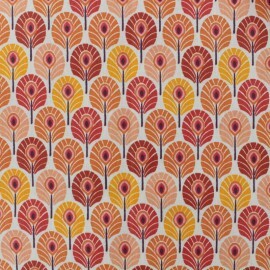 This autumnal fabric is ideal to make tablecloths, school bags, accessories, curtains etc. Superb fluid and lightweight fabric, ideal for making shirt, skirt, dress... His tone-on-tone motif, flocked brilliant brings a fun touch in all discretion. 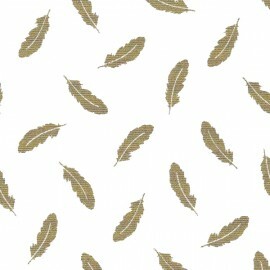 Beautiful trendy 100% cotton fabric, designed by Froufrou, metallic finition. Ideal to make clothes and accessories. From the "Tout ce qui brille" collection. Beautiful 100% cotton fabric, ideal to create lovely sewing work !